2014 was another big social year. We had a lot of interesting, controversial, exciting, and so much expected social media news. We start the year with a successful deal from Facebook. On February 19, Facebook announced that it has reached a definitive agreement to acquire WhatsApp, a rapidly growing cross-platform mobile messaging company, for a total of approximately $16 billion, including $4 billion in cash and approximately $12 billion worth of Facebook shares. The agreement also provides for an additional $3 billion in restricted stock units to be granted to WhatsApp’s founders and employees that will vest over four years subsequent to closing. 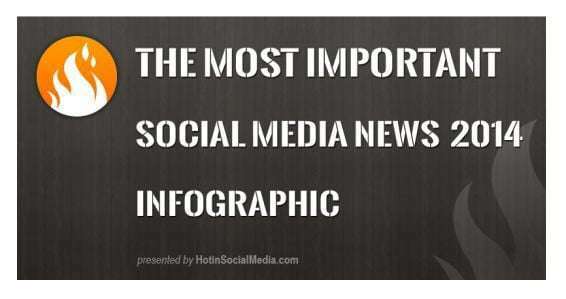 In this Infographic made by HotinSocialMedia.com you’ll find the most important social media news from 2014 ordered by month and by the time of the launch. Which are the most important social media news from 2014 and why (in your opinion)?